Tamalito's Cafe again hits it out of the the park with another super value, delicious dish off their menu. 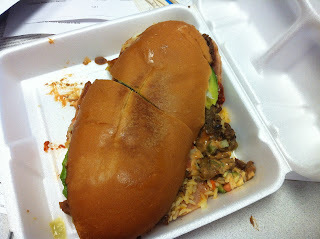 Ok I asked what was good today and I got the suggestion, "try the torta, its big and you'll look at it and say OMG". 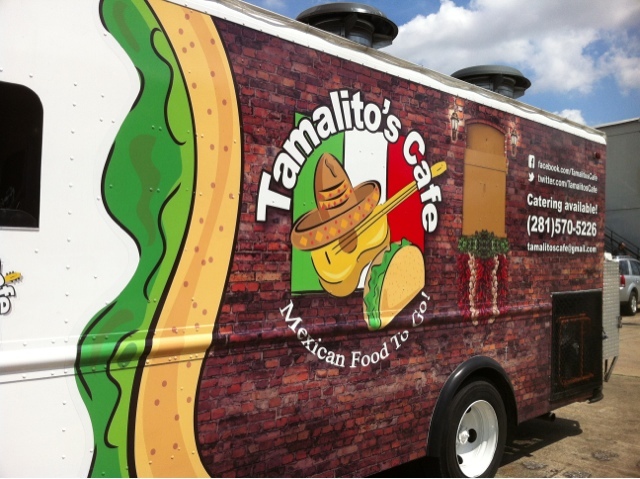 When a truck operator makes a suggestion its a good idea to take it, that should be the food they are most proud of. You get your choice of meat and I got the recommended beef. My past experience with their beef was excellent so I went for it. I wasn't disappointed, great seasoned and grilled skirt steak. That's just the starting point. A 10 inch bun, lightly pressed and toasted, rice and beans, pico de gallo, avocado and just to make sure its over the top, throw in some ham! OMG, look at that thing, it almost fills a 9 inch takeout box. The pico has a punch of heat and the avocado cools things right back down. Synopsis: Come Hungry, you don't want to miss a bite of this one.